As reported earlier, AT&T is now letting prepaid GoPhone customers use LTE 4G data on any capable device including the iPhone 5. However, more changes are coming. GoPhone customer care reps are telling users that effective June 20, add-on data packages will no longer be available on the $50 GoPhone monthly plan and only the $5 - 50MB add-on will be available to $25 plan users. "As of 6/20, the $5/50MB data package will continue to be offered on your rate plan. All other data packages will be discontinued. Auto-renewal of those data packages will be canceled." "AT&T Free Msg: Starting 6/20, data packages will no longer be available for Smartphones on the $50 plan. You can continue to use Wi-Fi data, or choose a new Smartphone plan that includes data. We'll send you a message when the new plans are available." In place of the old data packages, users on the $65 plan will reportedly be able add up to 3 GBs of additional non-rollover data for $10 per GB starting June 20. "Beginning June 20, we're making some changes to our AT&T GoPhone prepaid plans to simplify our offers and better align with what customers are choosing and telling us they want. We've begun letting customers know about the changes in advance, and we'll have more information on new, additional plan options soon." Although lacking in details, the statement does confirm that changes to prepaid plans are occurring on June 20 and that there will also be unspecified new plan options. The elimination of data packages on lower priced plans is consistent with AT&T's past behavior. Just over a year ago, AT&T removed the data packages from pay as you go and daily plans forcing users who wanted data to switch to a $25 or higher monthly plan. Dropping the $15 and $25 data add-ons would have the similar effect of forcing users who want a useful amount of reasonably priced data to the $65/month plan. The addition of LTE and visual voicemail and the elimination of the iPhone/4G device ban are welcome changes. But dropping all the data add-ons except the $5 one from the $25 plan is not going to please light data and voice users who are used to buying an occasional $25 add-on and rolling the data over for $5 month. Originally published May 27, this story has been rewritten and updated with new information including text messages from AT&T to users confirming the elimination of all data add-ons except the $5 package which will only be available with the $25 Plan. $5 for 50 MB is a rip-off, especially when you can spend $10 for 1 GB. Go-phone is such a small part of ATT's revenue base meaning these changes will have a de minimus effect on ARPU. 10c/mb is the same rate charged by Ptel and Eco on prepaid, two of the best overall plans. Want a rip-off? Buy Pageplus at 99c; AirVoice at 33c; H20 or Red Pocket at 30c. If you think of this as covering email and light browsing data for a month, it is not so bad. Especially on the AT&T network. Yes, 10 cents per MB is a rip off. Charging more per MB does not change this equation. Separately, if you had a LTE enabled phone, 50 MB would be gone in New York City second. Please tell us, where we can buy a 1 GB option for $10 on AT&T prepaid? I don't want to spend $44-48 *every month* on Wallmart Family, PureTalk or ST (incl. taxes). According to GoPhone customer care, starting June 21, GoPhone $65 plan users would be able to buy additional data for $10 per gigabyte. 1st Qtr 2013 APRU: Verizon $54.67; Sprint $50.27; AT&T $46.89; Tmobile $39.71. Most people would just read the 10-k, 10-q filings or associated company press releases. Btw, ARPU is a meaningless number. When I worked as a High Yield Bond Analyst, I got to meet the executives of the leading paging companies (does anyone still use a pager?). It only speaks of the avg revenue and doesn't address the cost side. That won't work. Data packages can only be added to monthly plans which start at $25/month. Alternative: GoPhone 10c/min, 83 min/month + FreedomPop 3G/4G service @$3.49/month for 500 mb = $11.82/month. FreedomPop doesn't work with phones so you would have to carry a wireless hotspot along with a phone. I doubt many people would want to do that. Agree: Live with 29mb on AirVoice $10 plan (83 min +early renewal = $13), or get another pocket to carry 500mb. How do these planned changes compare with the Aio offerings. It sounds like GoPhone would have been competitive with Aio before these changes. I'm betting that's the reason. Aio has only monthly unlimited plans with more generous data allotments than GoPhone (2GB - $55 and 7GB - $70). But data is throttled to 4 Mbps and no there's no LTE. 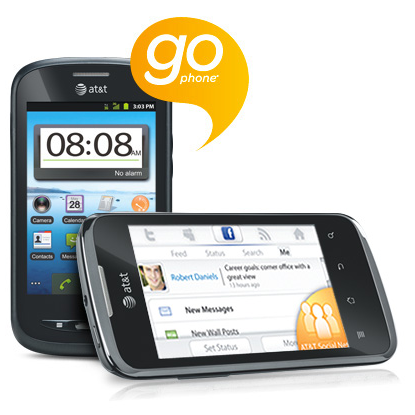 Nothing Aio has is directly competitive with the GoPhone $25 plan, rollover data package combination. for me, maybe use 100 meg per month because usually on wifi. so if this is true, this means for me: pay $25 to get 1 gig data for now while you can. be happy with that. use it judiciously. and pay $5 a month to keep it rolling over for as long as you can. assuming they allow the rollovers. and when it's gone, then it's $5 everytime as you run out. AirVoice Unlimited with 100 mb is only $2.50/month more than GoPhone with rollover 1gb. That's only one Starbucks/month. Or talk more, surf less. This gap between Aio and GoPhone opens an opportunity for Verizon to sweep in and pick up those dissatisfied with lack of Aio speed and GoPhone's exhorbitant pricing. All Verizon needs to do is maybe start with it's 2GB and 4GB prepaid offerings and see how things go or to prevent dilution of their brand turn to Page Plus. Maybe they up the prepaid prices by 5.00 per offering? I read on THE VERGE that the new HTC ONE (M7) that is being directly sold at the HTC Store can utilize the LTE from B-O-T-H At&t and T-MOBILE...If this is correct, is it correct to assume that there would be 2G & 3G connections with BOTH At&t and TMOBILE as well? Do you think this is the inevitable universality of GSM-Sim phones, where FINALLY a GSM phone will function EQUALLY on different carriers?...Would be terrific, if true! I'm sure we will see more phones with mult-band LTE support. The Nokia N8 and some other Nokia models have both the AT&T and Tmobile HSPA bands for 3/4G data. ATT should reconsider their pricing if they want GoPhone to make a profit. In my opinion it should be 60 dollars for unlimited call and text along with 2gb of data. Then charge 10 dollars for 1gb as extra data and keep the rollover policy on the data. I would go with that! Red Pocket Mobile has the $59 unlimited talk and text and 2 GB data. Not sure if they have extra data add-ons, though. Yes, the sleeve is very late because they put its cellular radio right up against the radio in the iPhone 4/4s, and the FCC has never tested that config before. Freepop says the iPhone 5 sleeve will be a thinner, different design (with no battery booster), so no FCC problems. They are also supposed to release a 'LTE clip' for WiFi iPads later this year. Clips on to the iPad, Sprint LTE. I got a text message from AT&T this afternoon. Are you using the $50 AT&T plan now? Perhaps folks on the $25 plan got a similar message. If any $25 plan users got the same or a similar message please post it in a comment here. > the new plans are available." sounds like new plans are on the way? between the $25 and the $65, like a $40 plan and a new $50 plan or whatever with a block of data included that can be used on a smartphone? Yes, I've been on the $50 plan for more than a year. The text message does hint at new plans that are apparently coming but I haven't received any new info and I don't bother calling CS, just to have different reps telling me different things. freedompop is not an option for those of us in the woods. If you can get Sprint 3G in the woods, you can use the Overdrive Pro on Freedompop. $3.99/month for 500mb. EG, no Vwz in most of WV and western VA, but Sprint 3G works fine. I was told that, after June 21st, only the $5 package will be available to $25 monthly plan, whereas no data add-ons will be available to $50 monthly plan. Att is crazy, They need to lower those plans if they want my business, why would I switch when I'm only paying $40 with Boost Mobile and I get super fast up to 2.5GB of LTE and unlimited 3g after that. The trouble is that Sprint's LTE coverage is not nearly as comprehensive as AT&T. Where I live, if I want LTE, I've got a choice between AT&T and Verizon. It isn't much of a choice. If and when LTE becomes available on Boost in my area, I'll consider becoming a Boost customer. Yes you are right, Sprint's LTE coverage is much smaller as of right now. Eventually it will be in more markets. ZACT will be up and rinning soon. sounds like to me that AT&T wants the $50 plan to be only for dumb phones since the $50 plan does have unlimited data but only for dumb phones. so, that leaves the $65 plan for the smartphones users who AT&T may really want and who may be willing to spend the money. and the $25 plan + the $5 data package would be for the those folks with smartphones who may not need much since they may make very few calls and may use a lot of wifi when at home or work and may only need data when they are out elsewhere where there is no wifi. at least, it sounds like AT&T is giving smartphone users at least those two plans ($65 and $25). if AT&T took away the $25 plan and not provide at least the $5 data package, then there may definitely be more of a mass exodus away from GoPhone. personally, myself can live with the $25 plan with the $5 data package and with the occasional $5 refills when data is running low (because using wifi most of the time). the $5 refills would be like another starbucks coffee or two for me as suggested in a previous comment above. I got my text from AT&T two weeks ago. That day, my BF got me switched over to Boost which is his carrier. I will say that AT&T reps are a**holes. They were trying their hardest to get me to switch over to a post paid service. I'll never go back to AT&T. CSRs started to tell me that the $5 data package won't be available to the $25 monthly plan, neither. Grrrr!!! would like to think that those CSRs are in error where those CSRs are idiots who are confusing the $25 plan with the $50-plan-no-data-packages. but if not, would guess that other new monthly plans with data included could be on the way. yet it looks bleak if those CSRs are speaking the truth. may have to get my airvoice sim card ready to activate.... sigh. Rumor is that AT&T will be offering lower-priced talk and data packages that will render the current plans somewhat redundant. I say "somewhat," as the best case is that I'll still be paying more, but perhaps not the ~$20/month more for the $65 deal. IOW, the typical AT&T carrot and stick BS. Fingers crossed. Thanks, I updated the post to include the text you posted. So I will getting one $25/1Gig on June 19 and live with $5/50 after that. thanks for talking to 611 and finding out about the best way to stack. on the one hand, want to go that route, but on the other hand, wondering about any other possible tweaks that may be coming for the gophone plans and data package restrictions etc..... ??? Well the changes are available to see online today. There's new $60, $35 and $40 plans. The $60 gives you the PRIVLEDGE of buying 1 Gb for $10 if/when you use up the 2 Gb you get each month. The $40 comes with 200MB with $5/100Mb available afterwards. And the $35 is unlimited!!! Go Figure! So after I run out my 2.5 Gig accumulation (which might take forever!) I'll switch to the $35 or $40 plan. I'll bet dollars to donuts that if you move off of the $25 plan you may not be able to move back to it within a period of time or -someday- at all. They've done this in the past. SIGH! I absolutely understand when there is a legitimate need for data. Why there is a need for such an overabundance and expect it regardless is another issue. I don't think many here expect an overabundance. Most of us just want a moderate (and useful) amount of data for a fair price. The carriers, though, love to sell big blocks of data on a use-it-or-lose-it basis, market phones as, basically, portable TVs, then complain about their bandwidth-hog customers. Go figure. We will know in a few weeks about the new GoPhone plans that AT&T says are coming. They will likely include more than 50mb of data.